When you think of a terrifying 20km-wide nuclear fireball raining deadly radioactive particles across the Nevada desert, having an atomic bomb party probably isn’t the first thing that crosses your mind. In fact, most places in America “ducked and covered” at the thought of an A-bomb going off—that is, save for this little slice of the Mojave we call “Sin City.” The atomic age in Las Vegas was handled in a way that only Las Vegas knew how…with an atomic cocktail and a front row seat. The 1950’s were strange times. Not that I was there, but from what I’ve read about people toasting radioactive dust clouds while listening to the Smothers Brothers, it seems people were just happy to be alive. Paradise America didn’t last, or at least it was dulled by the oncoming Cold War. It turns out we weren’t the only ones developing atom bombs. Russia had an arsenal to make our collective hearts race. It was time to up the ante. Atomic bomb testing became a part of life for the American Southwest, and Las Vegas did the best thing a city caught in the middle of the fallout could do. Joe and Stella Sobchik opened up a neat little diner in Downtown Las Vegas called Virginia’s Cafe in 1945. World War II was a time of rationing food and resources, so owning a cafe wasn’t the promise it once was. 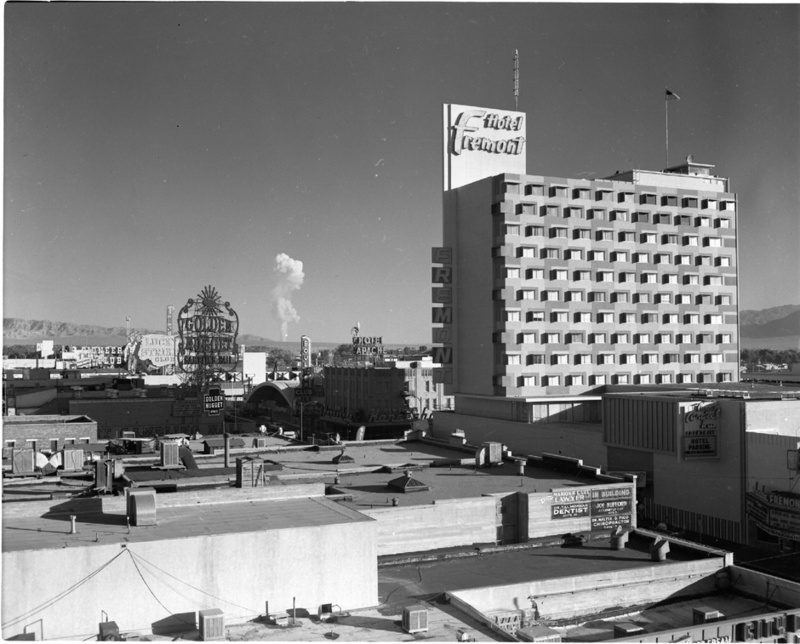 The history of Downtown Las Vegas as we know it started around this time. It was a time when people decided they’d rather have a drink and forget about their worries, so Joe Sobchik had much bigger plans for Virginia’s Cafe. More drinks, less food. It was 1951 when business took off. Not coincidentally, the U.S. Department of Energy had scheduled nuclear tests every three weeks or so. The massive blasts could be seen from far away. Like, really far away. The bar patrons found that the roof of Virginia’s Cafe was an ideal spot to check out the flashes of light with glowing mushroom clouds following shortly after. It would seem the Sobchik’s fates were sealed, and they now had the hottest spot in Downtown Las Vegas. It was 1952 when Virginia’s Cafe officially became “Atomic Liquors.” The birth of the Atomic Cocktail brought fame and famous people, notably everyone’s favorite Rat Pack crew Joey Bishop, Frank Sinatra, and Sammy Davis Jr. If you weren’t enjoying the “clouds,” you were bumping elbows with the likes of them. Atomic Liquors was, especially then, the heart of Las Vegas and not just for the frequent celebrity appearances and atomic explosions (a strictly Vegas quality). It was the most popular hangout spot for mobsters and wealthy men. Everyone came to see the amazing spectacle of America’s own “Destroyer of worlds.” The atomic bomb tests were even announced beforehand, so it became a highly advertised city-wide event and Atomic Liquors was the venue to showcase. Business was really good for the Sobchik’s for many years to come. Things hit a decline in the early 1980’s when Fremont street started becoming sour. The economy wasn’t so hot, and DTLV became the home of homeless. It was the place where many gang members met their bitter ends. The area where Atomic Liquors was located became especially dangerous. People were told to avoid that area and, thus, Atomic Liquors’ business was coming to an end. The 90’s were economically better, but they didn’t prove to be much easier. New bars and hot spots were popping up all over town, and people started heading to the Strip. Vegas was changing, and the population was booming, but there were no more booms on the horizon to draw up a crowd. Atomic Liquors was just another broken down old joint with a forgotten history. From 2000 until 2011, Joe and Stella continued to work to bring their bar back. Unfortunately, the couple passed away in 2011, and Atomic Liquors had to shut down. Atomic Liquors is open yet again, and business is better than ever. 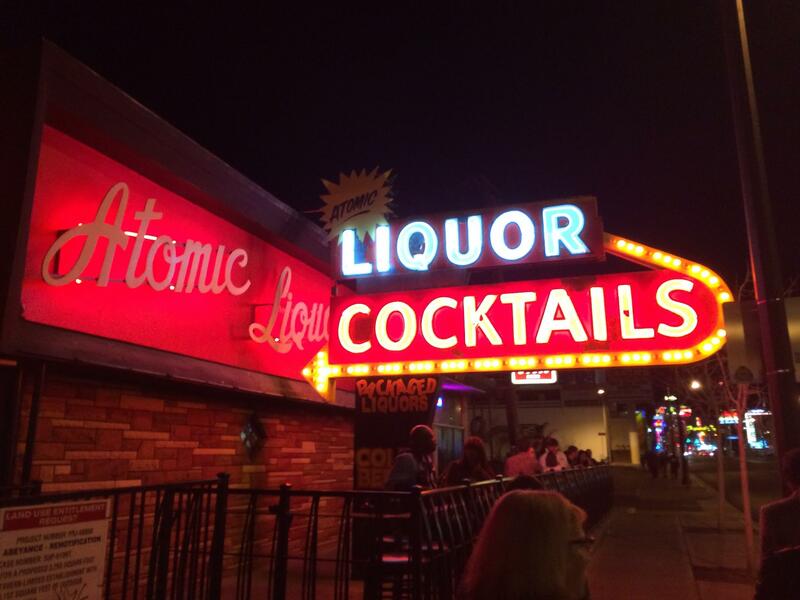 Atomic Liquors in Downtown Las Vegas has been resurrected, renovated, and re-appreciated to exemplify and respect its golden age glory. You can visit Atomic Liquors and have yourself an Atomic Cocktail alongside other drink specials. Gather up some friends and take the Vegas Pub Crawler all the way through history.